October is traditionally one of the very best months to fish the Big Bend, and this October has not failed to live up to that reputation. 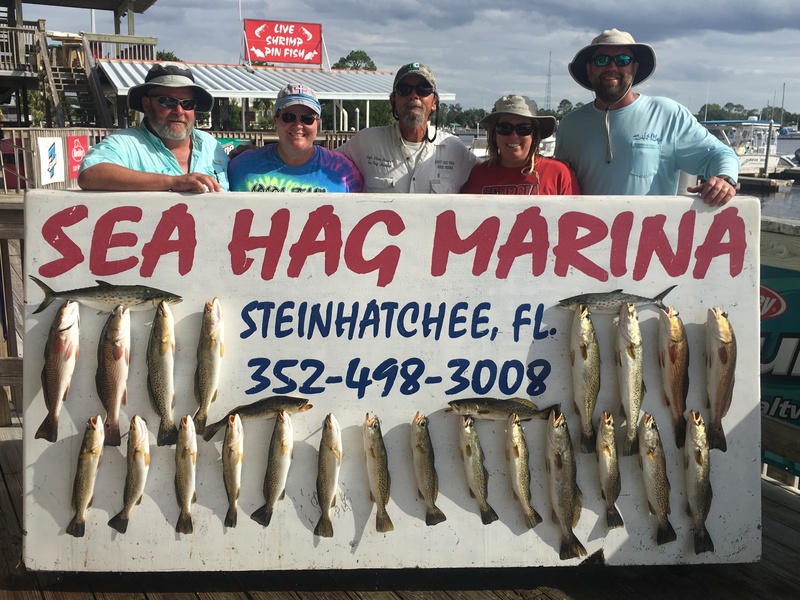 There have been spectacular catches of trout, redfish, Spanish mackerel, kingfish, cobia, acres of bluefish…it’s just been a spectacular month. Large pods of baitfish moving through the area have set things on fire. 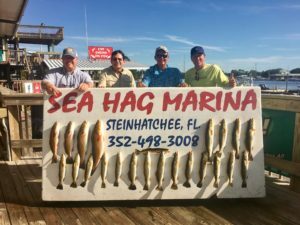 The trout have moved into shallower water; redfish are schooling, from lower slot to overslot schools roaming just offshore. 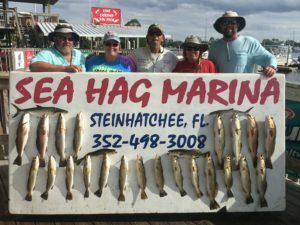 The only thing hampering fishing has been a lot of floating grass inshore, easily manageable by using popping cork rigs or jigs. 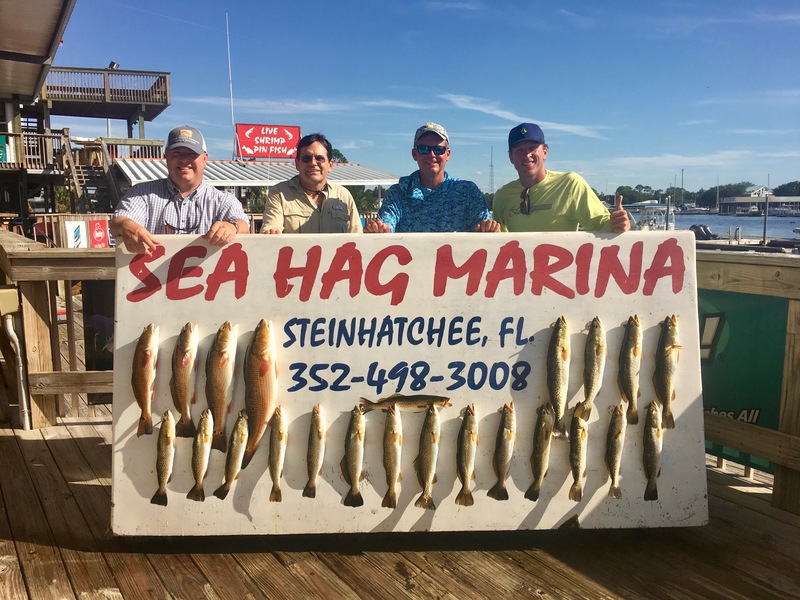 I was involved in a large group charter with four guides and almost all limited out both days on trout and redfish. 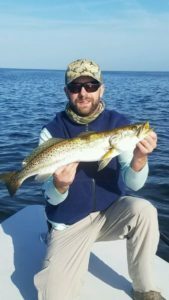 Fishing more recently on several trips we came across some 20 inch trout and 25 inch redfish fishing rocky shorelines with lures when we could avoid the grass, but switching to popping corks on nearshore humps provided non-stop action with trout, although there is a fair amount of culling short fish. 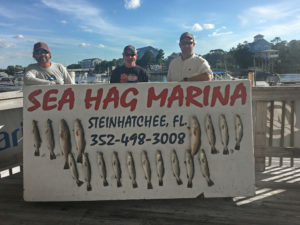 Here are some pictures from this month’s catches. 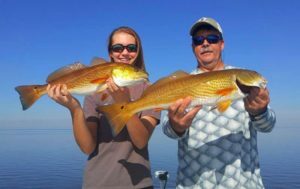 Jim and Morgan Carnes with a beautiful pair of schoolie redfish. 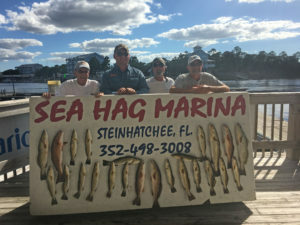 The Sea Hag hosted a Hooked on Heroes event for disabled veterans and it turned out to be a great day for all involved. 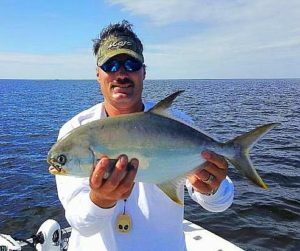 Toby Griffis came across this tasty pompano and invited him home for dinner. 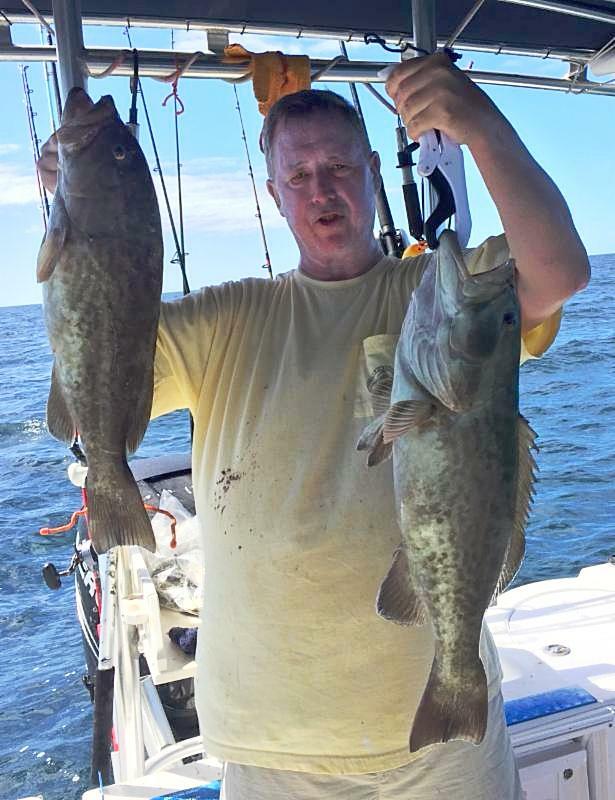 Derek Simpson caught these two beautiful gag grouper. Dustin Murphy found some beautiful trout on topwater plugs around Pepperfish Keys. 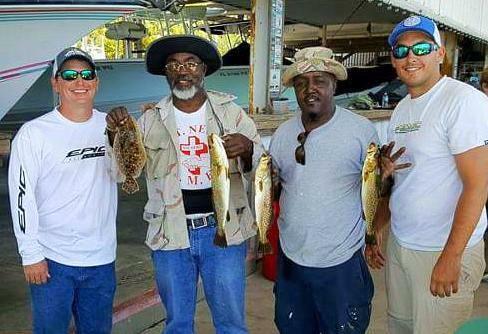 This group of folks from Atlanta tested their drags on these fine kingfish. 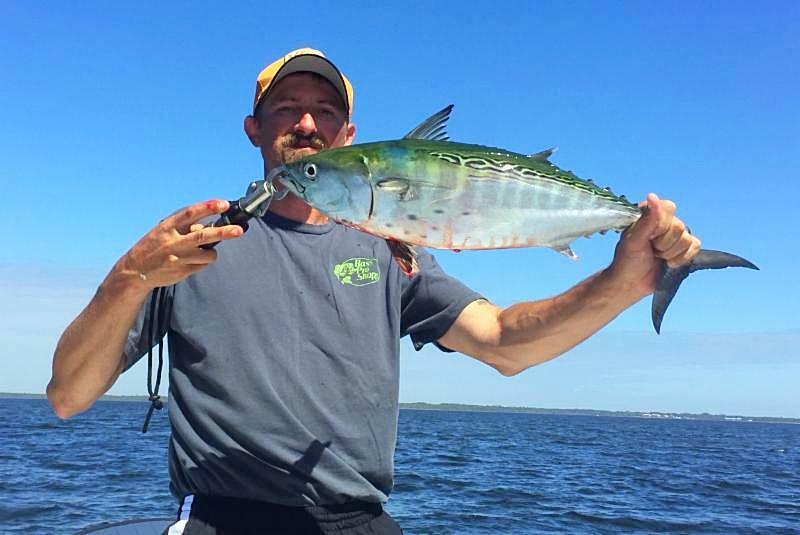 Daniel Colwell from Murphy, NC came all the way down to find this bonito crashing bait pods. If you are a diver, you can find these tasty hog snapper like Jay Wall did. Ryan Willingham and his nephew Connor found this redfish. 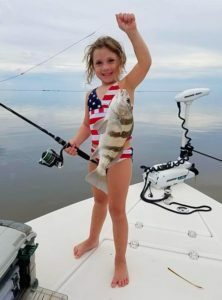 May Lee Grantham found this eating-size black drum. Mark Thomas and daughter Taylor had a great day! 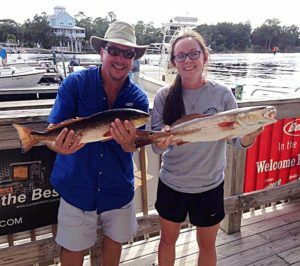 Kristen Skipper has the advantage of having a captain for her hubby, and it paid off. 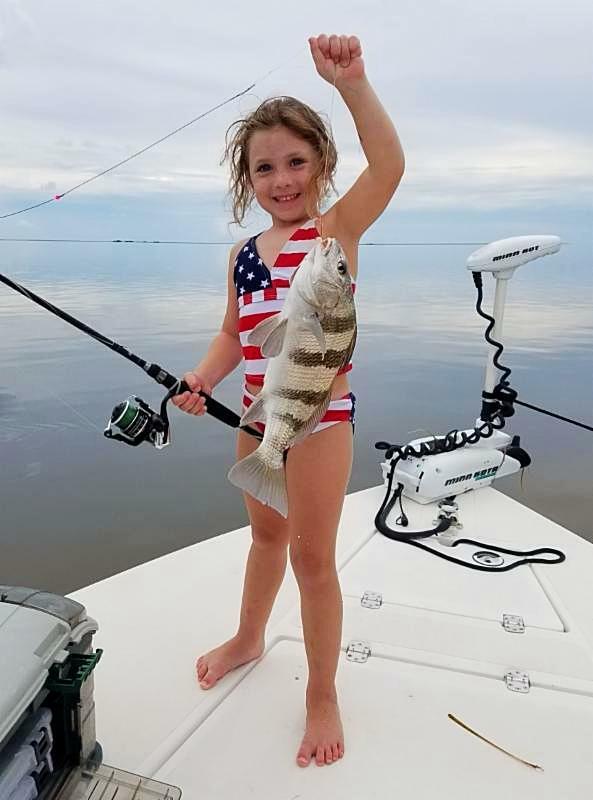 Glad that the Norwood family got a great vacation in the keys after the hustle, bustle and hurricanes that blew through this season. 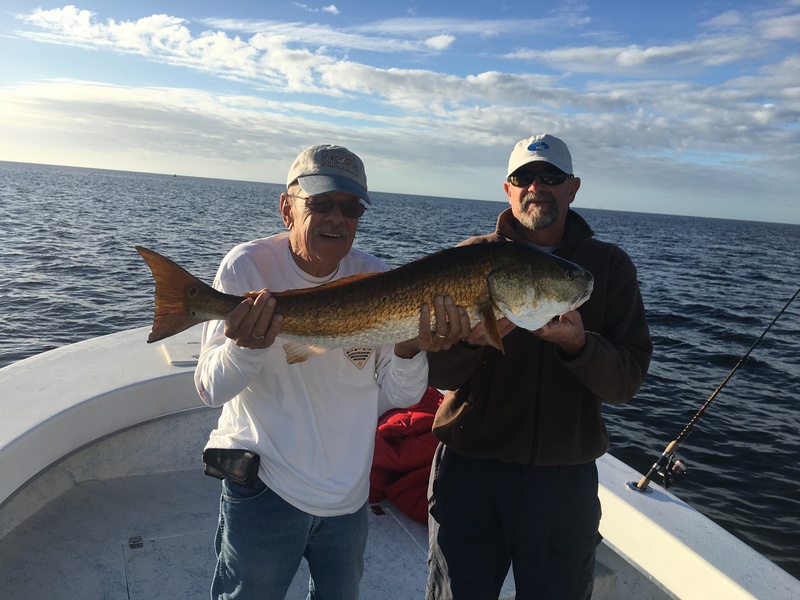 Another fantastic fishing month. 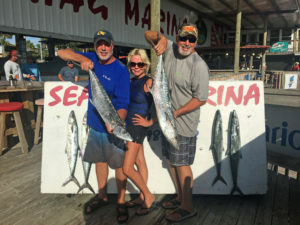 Temperatures should stay moderate until near the end of the month, and the migrating pelagics, cobia, Spanish mackerel and kingfish will still be following massive baitfish schools on the way south. 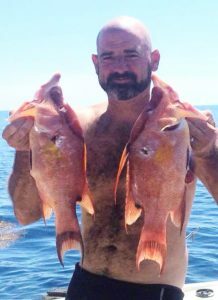 Do not pass up the chance to target some Spanish. 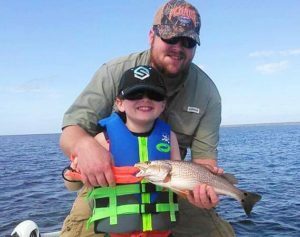 They are easily found, around bait pods, and easily caught, which makes them a great family fishing species. 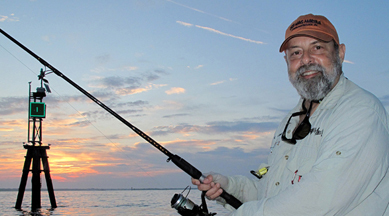 Don’t forget to use a 12 inch piece of wire leader, and troll or cast for them with spoons (I like the old-style Clark spoons) or “floreo” jigs. You can find both in the Sea Hag Ship’s Store. 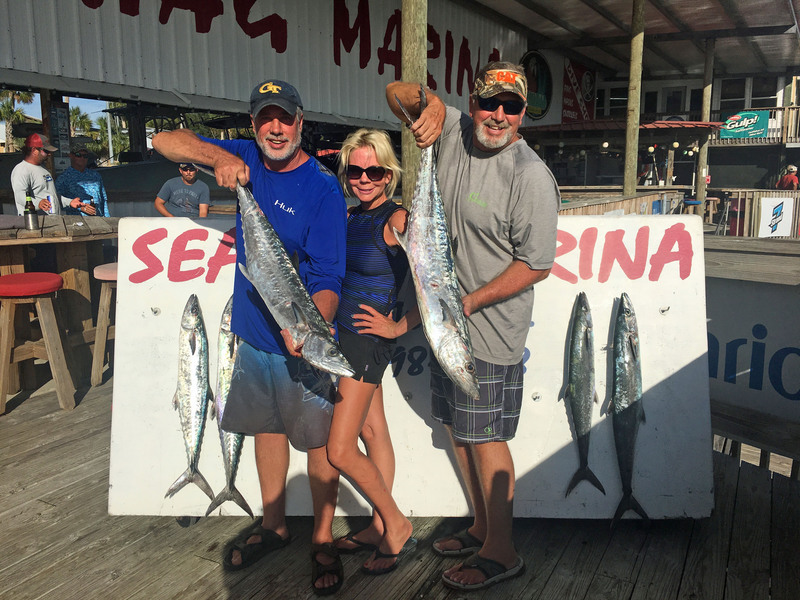 Look for fish around the nearshore bars like 9 Mile Bank or Little Bank, and be prepared if you run across some much larger kingfish, so use sturdy tackle. While a lot of people don’t like to eat mackerel, fresh fish marinated in Italian dressing and grilled is hard to beat. Cobia will be around offshore structure, along with kingfish; fish with live pinfish, don’t forget the wire leader, and keep your drags set lightly in case of a kingfish attack. You can always tighten it later. 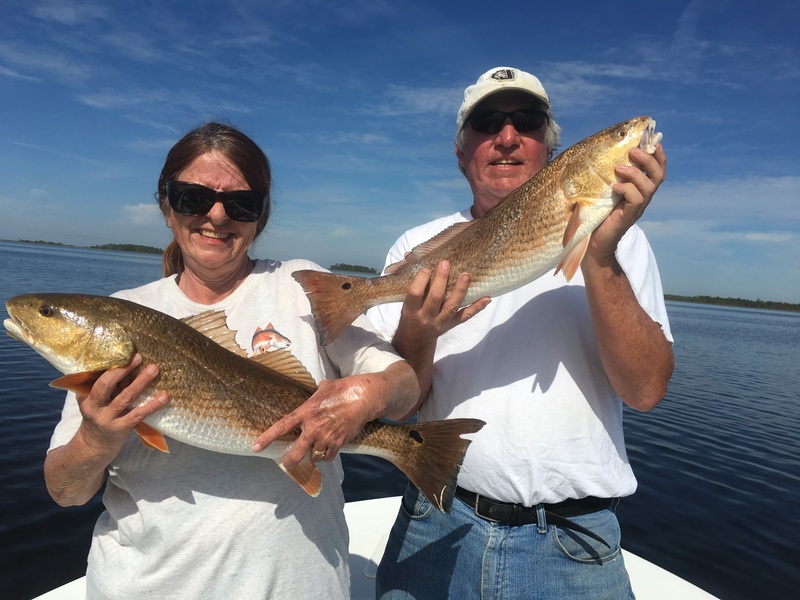 Inshore, fish in 3 to 4 feet of water with popping corks and jigs with Gulp baits or live shrimp. 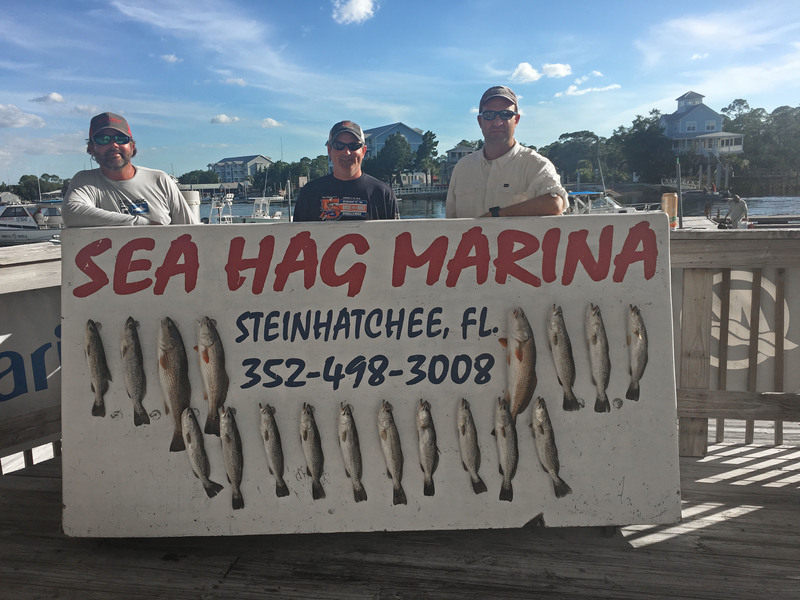 Hot spots have been north of the bird rack to the north and around Hagen’s Cover, and outside of Hardy Point and Sink Creek to the south, but any mixed grassy bottom in the right depth is likely to hold fish. If you don’t find any fairly quickly, move. Look for redfish schools 100 to 200 yards offshore, and moving in with the tide. You’ll need to make long casts to keep from spooking the fish; regular jigs with Gulp tails or Johnson gold spoons will work fine and avoid the grass problems with treble hooks. And this is also a great time of year for flounder; fish large sand patches with jigs dragged slowly across the bottom. 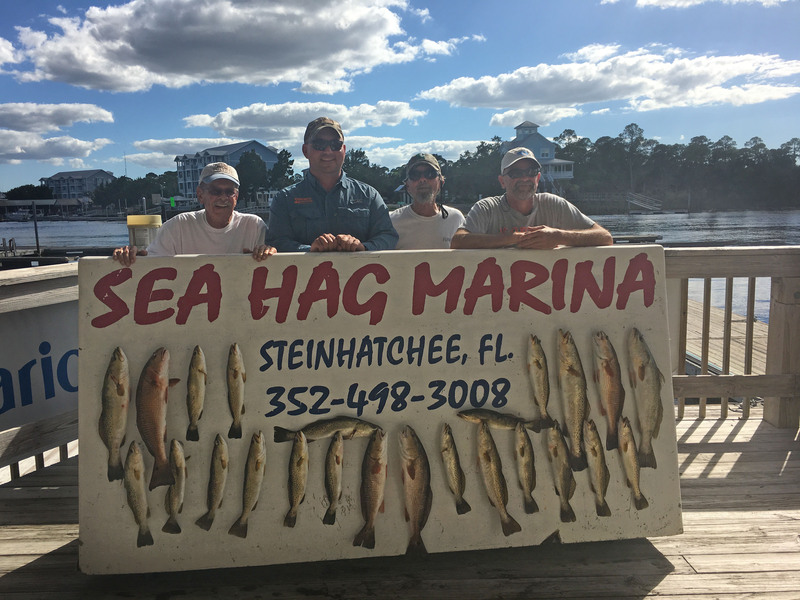 On deeper sand patches, in 10 to fifteen feet, there will be some large ones. All told, it’s a great month as long as the weather stays in check. 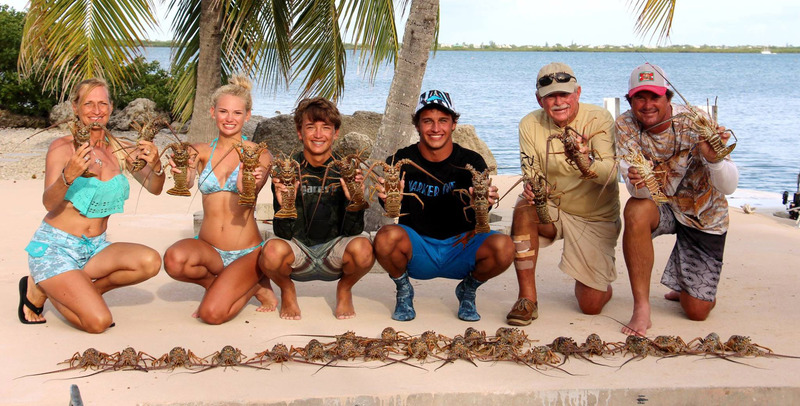 Come check out a rental boat, dress appropriately, and you’ll have a great trip.